And even create more powerful relationships than many other lifelong friendships. How do you see yourself as a financial planner? Do you see yourself as untrustworthy? Do you see yourself as a product-seller? Do you see yourself as a ponzi-schemer? You and I (and most CFP’ers) believe that we can be helpful and meaningful in people’s lives with our financial planning services. By always doing the best work in our client’s interest and by making them think and feel great about themselves. But who’s right: Your clients or you? The answer is: you both are. You and your client can see the same thing, disagree and yet both be right. Well, here’s a picture. Take a look. A good look. Do you see a woman? How old would you say she is? If you are like me when I saw this picture for the first time, you probably would describe the woman in the picture would be about 25 years old. Lovely. Fashionable. A small nose. But what if I were to tell you that you are wrong? What if I said this picture is a woman in her 70’s who looks sad, has a huge nose and – well – is not really attractive. So who’s right? Just take a look again. 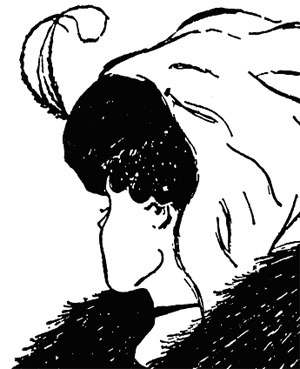 If you look again, and again, and again, you might see the old woman. If you don’t, keep trying. Do you see her big hook nose? Her shawl? If you see these two women, then be proud of yourself. It’s really not that easy, and it takes some time to really see it. The reason why I let you experience this is for you to demonstrate that two people actually can see the same thing, disagree and both be right. While you might see yourself as an honest, smart, passionate financial planner who always has the client’s best interest in mind. Your client might see you totally different. And maybe even as an untrustworthy person. How can we make our clients see us as we see ourselves? How can you become trustworthy while your potential clients see you as untrustworthy now? And after trusting, even create an insanely powerful connection? It’s when you meet someone for the first time. You can’t put your finger on it. Because you seem to have nothing in common. On paper, it might seem you’d never be friends. But you do. You just click. When you click, you feel an instant sense of comfort. A moment when you are fully engaged and feel a certain natural chemistry or connection. Typically it takes weeks or months before most clients feel truly comfortable with their financial planner. Planners have to gain the client’s trust. You need to find a common language and establish an emotional bond. So, what if you can establish this “instant click” with your potential and current clients? If you want to know how to enhance your conversational skills, you might want to check out my course: Conversations with Results. Because it's 100% tailored to you, as a financial planner, and also to the "financial planning process." I want to introduce you to Greg Sancier. Sancier – a veteran-negotiator of the force – draws upon his extensive training in human behavior when dealing with crisis situations, like hostages. 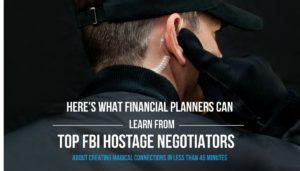 He is one of only a few hostage negotiators in the country who holds a Ph.D. in psychology. Sancier is able to create instant intimacy on demand, even under the most stressful of conditions. That’s why Sancier’s approach to negotiations offers an important perspective on how instant connections are made. So what helps financial planners to form that kind of instant connection? Even if people don’t trust you at first? Of course, it takes natural charm, likeability, and friendliness to reach out to your clients. It’s what Sancier also needs (and has) to reach out to “his” suspects. However, these are not the most important characteristics. One of the best “click accelerators” is this: vulnerability. Now, we are financial planners and we are educated to think and act as a true left-brainer: analytical, logical and rational. Therefore this might seem highly counterintuitive. Because we assume that when we make ourselves vulnerable, we are putting ourselves in a susceptible, exposed or subservient position. By revealing our inner fears and weaknesses, we feel we allow our clients to gain power of influence over us. And that is really scary. But in terms of creating an instant connection, vulnerability and self-disclosure are, in fact, strengths. They accelerate our ability to really connect with our clients. Because you appeal to your client’s emotional right-brain. But what happens after this click? Allowing yourself to be vulnerable helps the other person to trust you, precisely because you are putting yourself at emotional, psychological, or physical risk. Other people tend to react by being more open and vulnerable themselves. The fact that both of you are letting down your guard helps to lay the groundwork for a faster, closer, personal connection. When you both make yourself vulnerable from the outset and are candid in revealing who you are and how you think and feel, you create an environment that fosters kind of openness that can lead to an instant connection - a click. It seems logical that the connection-effect is brief. Short. Not lasting. Because this click is also brief, short and probably not lasting, right? Your left-brain is fooling you again. In an experiment by Art Aron, a professor at Stony Brook University, two groups of students (who didn’t know each other) were paired off. The students were asked questions over a course of 45 minutes. Half the pairs were given questions about their favorite holiday, the best TV show and foreign countries they like to visit. The other half of the pairs were given questions to elicit much more revealing information. Questions like: “What are your most treasured memories” and “How close and warm is your family” and “What’s the last time you cried in front of another person”. It appeared that – in the latter group – the intensity of the dialogue partners’ bond at the end of the vulnerability interaction was rated as closer than the closest relationship in the lives of 30 percent of similar students. In other words, the instant connections were more powerful than many long-term, even lifelong relationships! We so rarely find ourselves in situations where both individuals exhibit authentic vulnerability. But one’s ability and willingness to be vulnerable can accelerate a meaningful connection. Which is what you want with your clients. You want a meaningful conversation with your clients about their wants, their needs, their goals. You want to establish a true connection that lasts. It turns out that there’s a hierarchy of vulnerability in the types of communication we have, each one being more open and more likely to lead to a solid connection. To create the intimacy at the peak-level professor Aron accelerated the getting-to-know-you process through a set of questions crafted to take the participants rapidly to the “instant-connection-level” within 45 minutes. And I’m giving you those questions to use them in your financial planning practice. If you want to receive a free PDF about 6 Powerful Questions That Ignite a Click PLUS The Most Inspiring and Popular Video About The Power Of Vulnerability, I’m asking you a favor. I’m asking you to be really honest with me and my platform Smart Financial Planner. Just tell me what you don’t like. What can be done better? What’s wrong? What would you like me to do differently? What’s annoying you? What’s frustrating you? Something technical? It can be a small thing. Or something meaningful. Do you want more? What’s missing? Anything, just tell me. I would really appreciate it if you do. Just tell me by leaving your answer – below – in the comment field. And you’ll receive the free PDF with 6 Powerful Questions That Ignite a Click PLUS The Most Inspiring and Popular Video About The Power of Vulnerability. Your articles really help in building my business! Ron, this is valuable information and I enjoy the write-up. This article brought me to your site and I cant wait to read more. I am a young CFP so articles like these help me build confidence and allow me to grasp on to something I can remember – story telling. What I dont like is that you don’t have a podcast. I would recommend if you have time. Also, I look forward to your insight on twitter as well. Ron, this is valuable information and I enjoy the write-up. This article brought me to your site and I can’t wait to read more. I am a young CFP so articles like these help me build confidence and allow me to grasp on to something I can remember. What I don’t like is that you don’t have a podcast. I would recommend that if you have time. I don’t like when you use the really light Grey font in parts of articles like the explanation of Phatic. Otherwise love your work. This has been quite an useful resource, actually. I’m working from Brazil, and I can’t find anything similar to your project down here…. so I guess there’s not much I could list right now as possible improvements. Thanks for sharing your research and for what you’re trying to do for our industry – a refreshing perspective. I think sometimes we can overdo the psychology side of things. Whilst important, I think a great financial planner can still create a genuine relationship without the need to dwell on the psychology of a relationship. I’d be very interested to hear more about your experiences in conducting initial meetings, particularly the first 10-15 minutes. I’d actually be more interested in hearing about the experiences of other planners with their initial client meetings. Different people click with different personalities so such a study should produce some fascinating content and provide interesting insights. I’d love to read about the different things other planners talk about or not talk about in those first 10 minutes, and what conversations worked and which ones didn’t work. Thank you Ron, I always appreciate your insights and hope to learn more! Ron, I read your blog regularly and always appreciate your reminders about the human connection. I read your blog regularly, and find that it brings me back to the reason that I gravitated towards financial planning, after starting a career in corporate accounting and then tax work. Like others have mentioned, more concrete examples and actionable steps in the text of the blog, rather than requiring comments, would be my only request. Thanks Ron, always thought provoking but really also would enjoy more examples of how this is put into practice. Maybe using examples from comments as a follow up the following week. I’ve always found connecting easy, but want to improve, and learn how to carry my genuine care for others into planning. Another great insight. Make plamning matter! Goodmorning Ronald, also great to read is Daring Greatly from Brené Brown. You are reaching good points, it is dificult to “judge” in a very few time(just about one article). Im really want to receave the pdf, lets see. I also find your emails and communications valuable, well timed, and relatable. Perhaps even more on how the brain actually works for certain buyers after going through the first meeting process then coming back in for a second meeting to close..I know this PDF will help with the initial meeting but also need help with closing in meeting 2. Thank you so much! I always learn something from your writings so thank you. I have been in the business for many years and have always had a knack of quickly connecting with most people and it is simply because of the vulnerability that you speak of. One thing I always do and maybe this goes without saying but after every meeting I have with a client I document the conversation. This makes it so much easier to pick up from where we left off. I do this even for clients where I don’t close a deal on the first go around. There have been instances where people have come back after a year or more and they are so impressed with the detail of my recollection of our first meeting. Makes it easier to close the next time around! I don’t like when clients seem interested at first and then freeze up as soon as we start getting into solving their problems. I ve not read enough to comment in detail. Short and snappy works best for me. Liking what I am seeing so far though. Good work! I would really like more \’meat\’. Solid examples of scenarios. Evocative, thought provoking, well-used successful examples. Your work is a blessing to me. God\’s best to you and yours. I appreciate you and all you do. I don\’t think your doing anything wrong, however I think you can take your work and make it more powerful. How, collecting \”success\” stories from your readers and then sharing them with your readers. You have an amazing opportunity to be a catalyst for positive change. I have personally benefited from this article. Keep up the good work. Thank you for your gift in exchange for my comment. Be well and keep up the great work. I enjoyed reading this article very much. My feedback (in order to earn the PDF:-)) is that there are some minor misspelled words. Such as \”Wel\”, on 12 paragraph just above the woman pics. As Suzie\’s offer to proof read, I would gladly assist you in this regard as well. Keep up the amazing work you are doing. Thanks for reminding me what has worked in the past. In a world that is so busy I often get so caught up in the details and worrying over the accuracy that I neglect to spend the proper time preparing for the actual delivery. My first read on your site and I really enjoyed it. Please could you send me the pdf? I am director of business development at my firm and the first person any prospect speaks with when inquiring about our services. I have been in the industry for 27 years and am licensed but do not practice as a financial planner. Much of what you talk about in this article I practice in those initial conversations and develop deep connections so people share with me some pretty intimate information. My issue is how best to transfer that sense of comfort to the prospect when they meet with our planners. Our planners are hired for their planning abilities, not necessarily their social skills like the sales people. I look forward to your list of questions. Being able to connect from the heart is so important and I think it might be separate from right/left brain – what do you think? I agree that willingness to be vulnerable as in the example is important too, and probably originates in the heart. I\’m new to the industry and recently came across your blog. Thanks for sharing quality advice when it comes to engaging with prospects. Thanks! I would not change anything, you write well and get your point across in an easy to read story book fashion. WELL DONE! My goal would be to write evergreen articles such as this one… One year later and we are still commenting! Hi Ron, I agree with Jim that content about what real professional advisors are doing to help clients with the behavioral side of investing would be useful. Thank you!! Love your blogs, great inspiration! Always looking for practical takeaway tips I can implement. If you could come up with scripts/ materials to use or run workshops for FAs on your stuff. Your material is excellent. I\’ve not been sure as to how I would improve it. Certainly, the theory is terrific. It does appear that applying it takes some courage and tenacity…..it\’s easy to feel the need to keep our armor on and our guard up. Thanks Ronald. I like the article and am very interested in the PDF. What I didn\’t like about the article is that there was no mention of age. As a young planner, I wan wondering how I could about revealing vulnerability while still displaying competence. I strongly agree regarding you emphasis on the ability to click emotionally. My problem is that I am sitting here (many years) trying to figure out how or what to say to make that happen. My business, comparatively speaking to what my industry incomes are is, mediocre at best. I have no criticism or advice for you. I think you are spot on. I look forward to more help. Thank you. I think you could be a bit more straightforward pointing out to people that this is a helpful blog, not a ploy to get us to pay for some newsletter or some coaching advice. I kept looking for what the \”catch\” is for some time. You could say something like, \”At no point in my writings will you find a request to pay for anything I offer. My goal is to help advance the profession of financial planning. All I ask is some honest, thoughtful feedback from my readers to help me make the blog better\” Thanks for the ideas I have read so far. You are playing a Psychological trick on all of us.the content is good , what i don\’t like is your ability to make us comment 🙂 to get this book . After all we are human and its a good strategy to utilize in our business. Hi Ronald, I think you are doing a terrific job in two important ways: (1) helping out fellow financial planners become better at connecting with potential and future clients who might not recognize initially their financial planning needs, and (2) help financial planner understand that they are here to help by satisfying a need; and in order to accomplish this, they must become life advisors and understand their clients in a more deeper level. I would promote more of this win-win philosophy, because at the end of the road it\’s not only about selling yourself and your business, but also about connecting with others in order to help them in a better way as well. I\’ll glad to have stumbled upon your website. Wish you the best!! What a great reply Cindy!! Thank you so much. Hi, Ronald–I first heard about you when I worked with Bernadette Jiwa. I\’m interested in content about what real professional advisors are doing to help clients with the behavioral side of investing. If your goal is to make financial planning matter, then we need to do more than answer questions and build financial plans. Once we have clicked with our clients, we need to do what robo advisors can\’t do–help people change. How to get prospects to take action now instead of procrastinating is a challenge I have. Also, clicking makes very good sense but determining which spouse (or both) is also a challenge. Ronald, I love tot read your posts. I am secretely a bit jealous. It\’s difficult to write blog\’s wicht touches people or inspire people. I Think you do a great job. What can be done better? Write them in Dutch ;-). Good, thought provoking blog — I appreciate the way you cite older articles for more information. I\’m very glad to have found you on Linked In and am now \’following\’. Hi Ron, I\’ve come across your articles today for the first time and have been reading with much interest. As I think someone else has said above, a lot of it makes sense and we may do it already, but often we don\’t talk about doing it and we don\’t communicate it with our clients. In this article I really recognise the bit about lack of trust in the industry, I know that I have written life cover that has paid out and protected families in the event of death, and critical illness cover that has cleared debts and paid for life saving medical treatment, I\’ve said clients thousands of pounds in tax and my advice has resulted in clients having a more enjoyable lifetime. However, when I\’m asked in a social environment what I do, I still find myself feeling embarrassed by saying I\’m a financial adviser because I know what the perception is. Having read your article I now intend to share all of this with prospective clients who tell me that they don\’t trust financial advisers. I\’m struggling to come up with anything I don\’t like, I\’m probably trying to read too much in one go – I read one article/blog and then get pulled off by a link to another, so maybe an easy read menu of articles/blogs – apologies if there already is one, as I said I\’m getting pulled around abit within your site. I love reading your stuff. I often struggle with the feeling that what you write about is idealistic, not realistic. Some ideas of yours I have implemented have not worked well. Then I sit and wonder if it is me that isn\’t working well, rather than your idea. Hi Mike, thanks for your comment. Please tell me what you\’re struggling with. 1) What do you love spending money on? 2) What do you hate spending money on? 3) What is your greatest financial concern? 4) What experience have you not yet had, that you would really like to have (think bucket list)? In asking the first question, I keep them talking by saying, \”Tell me more about that…\” or \”wow, tell me more,\” etc. Sometimes people will talk for five minutes or more. I then ask the spouse the first question, and so forth. This typically takes 20-30 minutes. From that put on, they are totally open and feel free to drop their guard as they know I am totally sincere in really wanting to help them. WOW John, this is great stuff. Thanks!! thank you. I\’ve just used your questions to make followers in my German speaking scocial network curious about what is written by Ronald, you and all the other engaged advisors and planners here. Great blog and a lot of common sense. What\’s not to like. I am going through a very difficult phase currently in my career where my numbers are not that great. I want to do everything ethically for the clients and at the same time not sound salesy or offer something to a client which will make me more money but the client does not necessarily need it. Thats where the business is getting affected a bit. Your blogs always help me stay on track. Its just been 2 years for me in this industry and there is so much more to learn. I don\’t have anything negative to say about your blogs (they have actually \’clicked\’ in my heart in my current situation). Happy to apply whatever works and discard the rest and move on. I can\’t thank you enough for sharing all this knowledge. Your blog is right on. Suggestions that I can implement to help me be a better advisor after every read! I don\’t like that I have to comment to get the PDF, not because of your request, but rather that it makes me put my thought on paper, which I tend to avoid. Writing is my least favorite task and responding to your blog is one way that I can be more comfortable and more effective in expressing my thoughts. Thank you! Some great insight – thank you ! I\’m new to the blog and have been really enjoying the content. My only \”development \” so far would be for more concise articles. Also – would love a way to search past blog posts, given how much great content you put out. Good article intro on a critical theme often overlooked in the pursuit to \’get to the money\’ prevelance in our industry. Cracking the codes to provide a seamless process from \’How are you and what can we do to help…?\’ to getting our clients boasting to others how we really helped change their world for the better lies deeply in understanding the correct communication methodology to use each time as well as the work and solutions. Digging deep correctly each time is difficult and the route can easily veer off in the direction of the smaller pictures or issues as clients see them. I don\’t know if your PDF will give the answer here but I\’m willing to give my comments to pay for the opportunity to improve. Just started reading your blogs and agree with your philosophy to get ourselves to enhance our profession through sharing. Am years in the business but embarking now on blogging to clients and industry colleagues to further business, personal and professional goals. I am a mental health and career counselor and newbie financial advisor. These type of deep questions and authentic conversations serve a great purpose toward improving the counseling relationship which is where ALL good growth takes place. Financial advising should be no different. Money is simply a secondary reinforcer that will allow us each to become the person we truly want to be. Rationality really only gets in the way. Sometimes it is a bit difficult to get to the bottom line of your material. More detail and clearer solutions would be helpful. Need more stories and more detail. All high level material. Ron, this is great stuff. I\’d really like to hear more about the left and right side of the brain and how these differ. could you do an article on that? Thanks. Great article, should be more FP\’s in the industry like yourself. You are definitely on the right path as far as I am concerned. What financial planners need to remember is how the power of great questions can create great relationships. With our clients permission to do whatever we can to help them, we can ask them questions that no one has thought of or felt able to ask. These can be so empowering to clients as they can discuss issues that they have know they have but could not find someone with whom they trust to have the conversation. Knowing that they now have you in their inner circle can give clients great comfort and a sense of security. As one client said to me last week, you are my voice of reason. If you think something is OK I know I can go ahead and do it. Your blog is really interesting. One way to improve your blog would be by using more pictures. A tactic you already applied in this blog. Another option would be to write articles with more content i.e. larger blogs. That would really make your blog more interesting in my opinion. I find challenges to be gathering documentation, but more than that, inspiring a sense of urgency (if they thought it was urgent they\’d be faster with providing documents and getting things done). I also found this to be a timely reminder that the majority of folks make all decisions (including who to trust) based on feelings rather than logic. I do agree with those who feel connecting matters, at least when it comes to developing a meaningful connection! I was introduced to your web through a collegue – I am still devouring the content – the skill to connect is not a natural one – especially in todays world of technology and the business of living life! There is a need to get quiet in ourselves to listen and communicate with confidence to our clients. This is I think one of the key areas that we miss – as people we have become mindful of that connection – where the intent is lost due to our own dispositions – masked behind excuses and our own insecurities. You have with this blog shown ways to demonstrate the humanity in financial planning – not just for the client but thankfully also for the financial planner! Keep blogging…! Ronald, thanks for the posts. Always some interesting reading. The double spacing between sentences slows the reading down. I\’m reaching to find any criticisms however. Keep up the great stuff. Thanks Interested in having more videos presenting conccepts in practice. I would like to see more tips for websites and more tips for review meetings to keep the client enthusiasm. The fine line between the boring stuff that needs covered; beneficiaries, workplace benefits, etc. and the story telling from the initial engagements. Keep energy high and motivation to save or increase savings high. Great blog overall though. Just found the blog, but like what I see so far. I\’m a big fan of the behavioral aspect of our industry and feel it\’s a huge growth opp for most advisors. Just found your blog and I like what I see. If you send me 6 questions and they are worthless as well as a ruse for my email…that is something I won\’t like! If they help me do my job better, I will be back! Great article and great cliff-hanger! I discovered your blog today and have found it very interesting. I am very analytical and struggle to connect on an emotional basis. My only advice would be to please keep providing \”nuggets\” to help out the analytical guys. Great content. My negative feedback would be – give us some crumbs and don\’t hold all the good stuff back. Perhaps share one or two of the 6 so we still get more value than just the theory you present. Hi, nothing I don\’t like re your website. It actually gets you to think! I enjoy your comments, but like some of the earlier contributors, I do find it irksome to have to submit a comment in order to get the next post. Perhaps that is my problem? Hi Ronald. I enjoy your blog and perspectives. I know my greatest strength is connecting with people but there are some clients that are more challenging than others. There\’s a great video on Ted.com by Brene Brown where she talks about vulnerability. This career certainly requires the use of both sides of our brains! There is a lot of available material on the technical side of financial planning but not as much on the psychological side so thanks for your efforts in educating us. Hi Ron, an interesting perspective – well done! The point of the vulnerability – as I see it – is to create a basis for empathy with the client. If we share, they are more likely to share too. If we can \’empathise\’ with our clients, we look out for their best interests not just from a rational perspective but from a human aspect too. It is about understanding the client\’s WHY, not the WHAT or HOW. I refer back often, thank you for your great work. I enjoy your approach to this blog Ron. It\’s refreshing and thought provoking. As a financial planner integrating life/lifestyle planning, it provides interesting background information such at that in this post around psychology. Given that you are not writing in your native tongue, the spelling and grammar is excellent. Far better than often seen closer to home! Interestingly my first thought when you ask for comments in return for information was \’I don\’t want to bother with that\’. On reflection though, I often hold unstated opinions and perhaps need to share more often. Thanks for an interesting insight. love your blog and look forward to it! It makes me think more \”right-brained\”. Concerning the language: I agree with Herko, but I understand your choice. My main frustration is not to do with your blog itself, but with the process to implement these ideas and approaches when it comes to interacting with clients. I think what I will do is re-read this blog right before my next client meeting so it is fresh and I\’m better prepared to execute the approach. Excellent blog, insightful, great content, challenges the status quo and has made me re-think the role of a financial planner. Like many I enjoy the content but don\’t always feel the need to comment and therefore miss the additional information information. The blog is great – however I stumbled across it via LinkedIn. It wasn\’t the easiest to then work out how to track down the blog and register. Most of Human being always think about themselves including me , How would this benefit me , who would I earn more out of services that I give . But I see your cause very different . you are helping other by sharing knowledge and excepting nothing in return , Your selfless services would take you to different levels of success. Hats off to you. My candid opinion is that your blog titles/subjects are intriguing, relevant, and well thought out. The downside, in my opinion, is that there sometimes appears to be too much wind-up per pitch. In this article, for example, I personally did not need to read about the picture or the public perception of planners. I do appreciate your efforts and I commend you for your genuine request for honest feedback. I love your work and really appreciate your generosity with the perspective and information that you so freely share. I believe that financial advice will matter to our clients much more as we start to \”get\” and implement from your viewpoint and will ensure we survive and thrive as a profession. Hi Ron, I regularly read your articles and the comments. Informative and innovative – always useful. I don\’t get what the real explanation of what the FBI rep does to connect is. It\’s incomplete. Oh, sorry Ray. It\’s about the vulnerability. The FBI negotiator could remain intellectual about the situation but what he does is that he waits for a moment \”when the suspect wants the negotiator to understand something about himself\”. And that\’s when he shares a difficult situation he had to endure himself, in his own life. Sharing a story of a loss – for instance, the death of his own mother, builds the bridge. I enjoy your posts, and don’t mind sending feedback. If anything it shows a willingness to listen, learn and adapt. Something many bloggers avoid. Keep up the good work. Sometimes I want more practical advice. I think I always appreciate the ideas. Sometimes I wonder how I can implement them. Let\’s talk about this in our upcoming meeting Mike. I really enjoy the blog and the thoughtful content. I feel more examples to drive home your points would be beneficial. I would enjoy seeing more stories and real world/practical examples how you (or others) tie in the financial planning information to client meetings using stories, analogies, metaphors that speak to the right side of the brain. I believe that the content of your blog hits at the heart of what true consultative advisers are looking for: rich, meaningul relationships with their \”best\” clients. Almost all of the blog entries seem oriented toward this objective. If one is a trancsaction oriented adviser, your blog may not hold as much interest. The only problem I have encountered is that if I try to print from the blog, it messes up our printer. That\’s right John. People first, business second. I\’m intrigued. This is my first time visiting your blog. I appreciate your willingness to work toward improving the profession. After reading this article I clicked on the \”About\” tab first. While there I noticed that your photo on that page is a reverse image of the photo at the top of the blog, or vice versa. To be honest, I found this amusing. My suggestion would be to use different photos or to simply not use one of them. Even using the exact same image would look better/more professional. Yes, please send me the PDF and the video. I\’d like to learn more about this topic. OK, haven\’t heard this before, but I think it\’s a good one. Thanks. another inciteful blog full of empathetic ideas. tell your client what makes you afraid and worries you about your family and finances. clients can see that you are the same as them and that you will work alongside them in future to \”keep them on track\”. this is a long game and we must be patient. give clients lots of generic stuff for free – as long as it does not cause you any risk – to build the trust and evidence of ability, experience and consistent delivery – and remember real trust takes 5 years to build and 10 seconds to lose! What can be done better? – Maybe audio and/or video option. What’s wrong? – Nothing. Really enjoy content. What you would like me to do differently? – Nothing. What’s frustrating you? – That I know the stuff you write about and think about it but don\’t articulate it like you! Something technical? It can be a small thing. – Nothing. Don\’t need more tech! What’s missing? – Show us how to write such relevant and effective blogs! Anything, just tell me. – Are you really a financial planner and not some business consultant! Great article as usual. I would say you\’ve added more tangible value to the soft side of finance than I have seen elsewhere. That being said I\’m still trying to figure out how to apply these concepts into my day to day practice without feeling somewhat like Stuart Smalley. On a separate note – don\’t have a solution – but most comments can be consolidated to one or two themes. It would be nice to not have to read the repetitive nature of them over and over again. I just found your site, so I don\’t know of how much help I can be regarding what you have done in the past, but I LOVE these articles on the client-planner interaction. I feel that it\’s where I could use the most coaching, so I will be bookmarking your site and returning often. I find your blogs very informative and helpful. However, like others previously I do think it tedious to have to post a comment to obtain more magical insight. I understand your reasoning but it is irksome to every time come up with comment. Please don\’t stop, it\’s just I will have to be less Anglophile and think of comment and put myself forward. I do not like that I have to comment to get a pdf. This is my second comment and I do hope I get it this time. The last time I commented I received nothing. I love to know about the right/ left brain science. I like that you provide quality content instead of quantity. I will tell you one BIG thing I do not like or what was a dissapointment for me when I read your BIO. I will tell you what it is after you send me the pdf. Thanks Bo, we already contacted and it worked now. I haven\’t found a way yet to not showing it to people who already visited my site (which I also prefer). You\’ve really helped me unnrsetadd the issues. Thanks. I think it\’s fair to ask for comments in exchange for the pdf file. In fact, I found it interesting to read people\’s comments. Great article. Agree with Susie in regards to the pdf. I enjoy reading your blog. I think asking readers to engage is a great technique. I am interested to read a summary of the top answers readers provide and some background on what you do with the answers people give. First up, love your blog. We share many of the same views as how we wish to be viewed as a planner and of what the business of financial advice should strive to become. I always find your articles interesting and like reading the comments because like you I like to here the views of others. I certainly believe in your approach to financial planning. I find financial planning can get boring if you are just having surface conversations about financial assets and don\’t cover what is really important to clients. If people subscribing to your blog aren\’t willing to add a comment (in return for a PDF that you have spend energy preparing) then this is disappointing. You aren\’t asking for money, you are just for asking for others to participate in the community discussion you are trying to encourage. Your recent article that requested comments about what great questions you ask clients was great example.. The people adding comments helped others in the financial planning profession. Some give with take isn\’t bad. Nail on the head Craig. That\’s a great example how we all can learn from the comments. I am very interested in the right brain thought processes but find it difficult to articulate the ideas into a discussion with someone you\’ve never met before. Examples would be valuable please. And I agree with those above about making comments to get more information. It annoys me. Especially when you start reading something and can\’t finish it in one sitting. I lose the flow and train of thought. After that I lose interest. I enjoy the read and try to apply it more and more. Love your comment Karen. Very useful and something to think about. Your blog really makes me think, and helps me to connect more with people, in general. In light of your desire to improve, I sometimes notice minor grammatical errors such as misspelled words. Thanks Marti, I have to admit that every time I write an article I hope the grammar is OK. Although I do have some writing-experience now, it\’s just not my native language. I\’d be more than happy to proof-read anything for you. What is there not to like about your blogs? I enjoy reading how to approach prospects from the right brain. I struggle at times as being new in the business. I know how important what I do for my clients is but often feel rejected that prospects don\’t see the importance of my business. I have trouble engaging prospects. Please continue your blog as I find it refreshing. You know I like to read your blogs but I\’d rather read them in Dutch but I understand your reasons for not doing so. So thank you for helping us all by putting is all the effort and time. Wie weet Herko. Zeg nooit nooit natuurlijk. Bedankt voor jouw reactie. a little like a coin , two sides.. This seems like inspiration for a new article Paul! Great blog, I am with some of the others. I feel that I just make stuff up sometimes to get more information. (not this comment though) I do feel that for avisor advice, this is the best blog I have seen. Good to know Mike. And thanks for your honesty. That helps a lot. Great article Ron. It\’s very unique for our industry. I really like your blog. You provide a fresh approach and deep insights. I guess if one wanted to be cynical one could ask: why do you do this? How do you gain? What\’s your ulterior purpose? Why I\’m doing this is because I believe in the importance of the financial planner. I believe that we can make financial planning matter more by creating an engaging and meaningful business. So that we can empower more people to make more conscious and better (financial) decisions. And even – eventually – create a better world. My gain has everything to do with my why. If my work doesn\’t matter, then why am I doing it? It\’s a great feeling to matter to others, to help others and to create something meaningful. I like being reminded to connect on the emotional side. I tend to operate like facts and logic sell and it hurts my business. I don\’t like on your site how I got asked to enter my info for an ebook and then was told I was already registered on your site and never received the ebook. Thanks and I hope you keep blogging! Sorry for that J.J. I hope you believe me when I say that I think it\’s a technical issue. I\’ve just send you the link to the page with the free eBook. I agree with Susie\’s comment about having to give a comment to get the .pdf. Otherwise I enjoy your blog. Ron, I love your blog! It\’s one of my favourites across all industries (and I regularly read over 400). The one thing I don\’t like is that you always ask for comments to get a free PDF. While it encourages comments, the comments tend to feel a bit shallow. I\’d rather read 3 well-thought through comments than 20+ one-line responses that don\’t add much value. Keep up the awesome work!! The profession is so much better for the work you are doing. WOW Susie! Can\’t tell you how much I appreciate this AND your contributions and sharing, which brings my blog to life. With regard to the \”comment-asking\” I\’d like to say that I totally understand you. I\’d like to explain why I do this because I have several purposes with the question-asking-stuff. 1) I hope that we can learn from each other. I notice that – although the article-reading-planners are from all over the world – we share the same problems. I believe it inspires us because we recognize that \”we are not alone with this problem\”. It\’s a reassuring thought. 2) It get\’s you and all the planners who read my stuff to think about what you really want or what problem you really want to be solved. Just as we as planners ask the questions to our clients that others don\’t, I believe there aren\’t many people (like me) who ask some difficult questions to you! Which helps you to make your business matter more. 3) I tried to get everyone engaged by NOT giving a free PDF, but that doesn\’t work as you can see in my earlier articles. 4) It helps me to write the next article. Because when I know the problems, mistakes or successes of you guys, the articles will be more helpful for everyone. However, I do believe you have a good point here. Some comments are \”just for the comment\”. That\’s why I\’m going to think about how I\’m going to solve this without \”losing\” the benefits of the things I just wrote about. Thank you very much Susie! I am a \”lone-eagle\” ( sole practitioner) with limited technical resources – unless I can convert your comments to stories that I can use, I find them interesting but unusable. Thanks Ed, I heard this one before. I\’ll take that into account. Thank you. This was an excellent article. I have always wanted to be perceived as intelligent and knowledgeable. That is to impressive with the left brain by talking and telling. Whereas, I never found the left brainers to be people that I was really attracted to. So, why would I want to be a left brainer? I have been doing the wrong things. Thank you for sharing your thoughts. They make sense and I will be better for having read the article. Keep up the great work!